Model: XNiteCamOut90Illum - 90 IR LED Illuminators - 25 meters Color during the day / Black and White IR at night. Auto-switching. 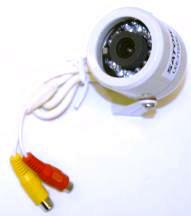 We have two types of outdoor infrared cameras with IR illuminators. One has 12 IR LED lights and the other has 56 IR LED lights. 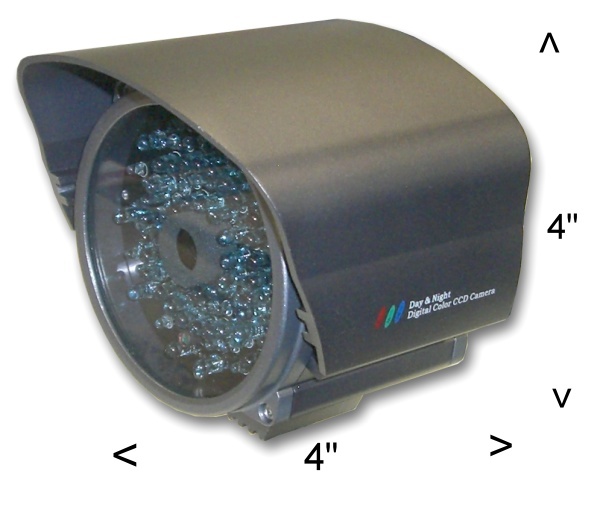 The 12 IR LED lights is good for about 20 feet while the 56 IR LED can see about 40 feet in complete darkness. Both require good quality power supplies. 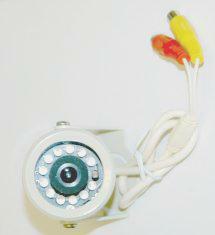 This small camera is has 12 infrared illuminators and is suitable for outdoor use where the camera could get rained on. The housing is sturdy diecast zinc with an attached bracket for permanent mounting. 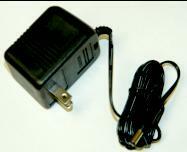 We include a power supply so all you have to do is connect and plug into your monitor, VCR or security system with the XNiteCam12Illum. We do not include a power supply for the XNiteCamOut90Illum. We recommend our XCamPS12 power supply of the XNiteCamOut56Illum. The XniteCam90Illum has 90 long range infrared LED's. The infrared LED's automatically switch on at night time and the camera switches from daytime color mode to infrared sensitive night time mode automatically. The 6mm lens will give you a 65 degree view angle at 50 feet.